"Mr. Zimmermann - Webdesign Service, Mr. Komo and Mr. Papadopoulos - Web Conceptions, have succeeded in expressing my identity through the website and implementing my wishes perfectly. Our team, Web Conceptions together with Webdesign-Dienst Überlingen were hired to provide a complete online rebrand solution, including a new website (design, development, SEO and content), new logo, and a kick-start in social media. At the same time, ensuring some level of continuity in branding, so as to maintain existing awareness and familiarity gained from the old website and marketing. Our team travelled to Germany on multiple occasions to meet with the client, and together with our local partner in Germany to work more closely and personally on the project – such as during the initial discussion and planning phase, and then later in development/pre-launch, and post launch. Crucial to this project was initial research for developing the online strategy, namely content writing and organic SEO, as well as the overall design in user experience. In depth key word analysis in German (primary market) and English, as well as competitor benchmarking ensured the website's content was well positioned to quickly gain strong online presence and search engine rankings. Also vital, was planning and building a custom back office (CMS) for certain dynamic sections of the website, allowing for easy maintenance and continued growth. This website is now sure to significantly boost Architektin Kelbing's awareness in its respective target markets, particularly Überlingen and the wider Lake Constance/Bodensee region of Baden-Württemberg in Southern Germany, but even other German-speaking markets Austria and Switzerland. It is also sure to gain exposure regionally, such as throughout the European Union (EU) and internationally. In turn, this should open new doors for the client and possibilities for providing architecture and design services. 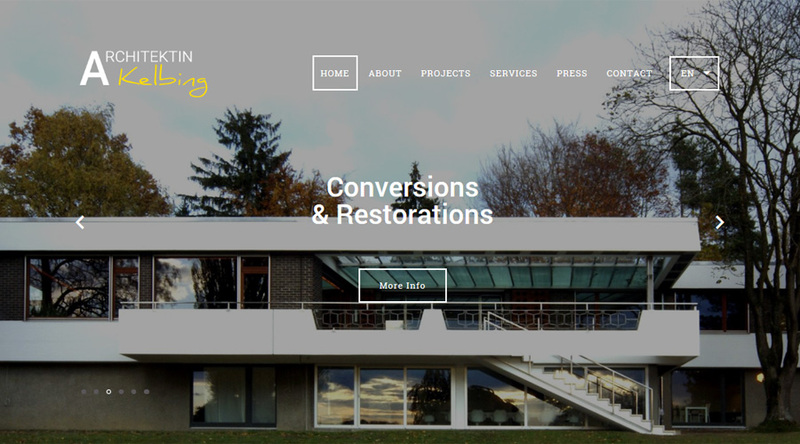 Backed by over 15 years' experience and know-how in web design, development, IT, SEO and marketing communications, this new architektin-kelbing.de website is an excellent example of our team's ability to grasp a particular business sector and the client's requirements and then bring this all to life online. It also further demonstrates our team's creativity, professionalism and proven working processes, able to easily and efficiently work with clients in different countries across the EU-Europe, as well as globally.